The world is full of colors and when dealing with dropshadows, that statement is also true. 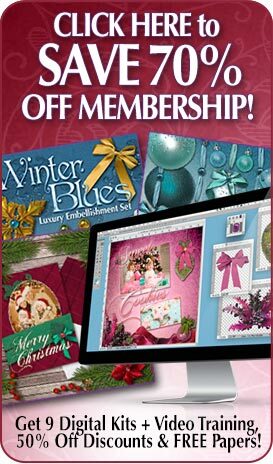 Making creative choices when you are digital scrapbooking, or any other type of digital design work can add a whole new dimension to the look of your final piece. We are all used to the normal black/grey heavy dropshadow that millions of companies use everyday in their advertisements. However, sometimes the mere heavy black or even opaque black doesn’t make your image pop, but rather dulls out the intensity of your images or text. In Photoshop (or other photo programs) it’s quite easy to apply the simple filter to add a drop shadow on any object, but sometimes adding black isn’t quite the option you want. Well, there ARE other choices. Remember, you are only limited by your own imagination, not by the software, and the same goes for dropshadows. 1. 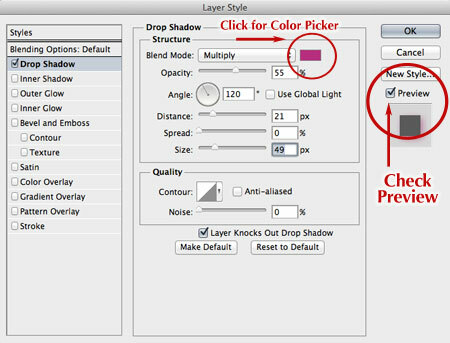 Select the layer that you would like to add the dropshadow to and click Add Layer Style from the choices listed in your layers panel. 2. When the Layer Style Menu opens, make sure you check Preview. This way you can see how any changes you make affect the layer that you are working on as you go. This will makeit easier to get things JUST the way you want them. 3. 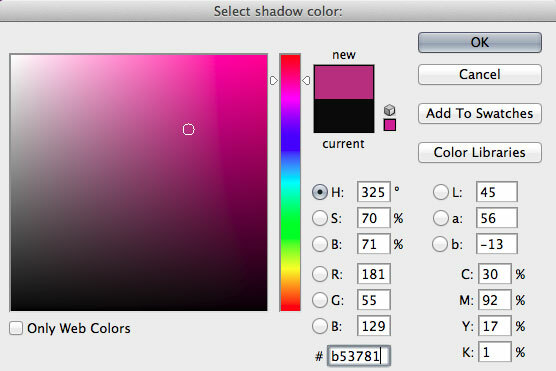 Click on the color swatch box to open the color picker. Then choose any color from the color picker or enter in the color# if you already have it. Try to choose a color that is complementary tothe object you are working with for subtle, yet beautiful results. Experiment as much as you like here. 4. Once you have chosen the color, click OK. Now you can return to the layer style dialog box and adjust the size and distance sliders until you achieve the look you desire. You can also change the way the dropshadow affects the layer underneath by changing the Blend Mode if you like, by choosing Overlay, Soft Light, etc., for different effects. Then just click OK.
See, it really is that easy! The world is full of vibrant colors and shadows, so why not let your art project reflect the same?